← What’s happening at The Italian Destination Wedding Show? The Italian Destination Wedding Show is just around the corner and we cannot wait for you to meet us and all our wonderful exhibitors! We continue our series of blogs today by presenting to you Tenuta Monacelle and Masseria San Nicola, two ancient mansions amongst the most beautiful in Puglia. Tenuta Monacelle is located in a peaceful, rural area on the outskirts of Selva di Fasano. 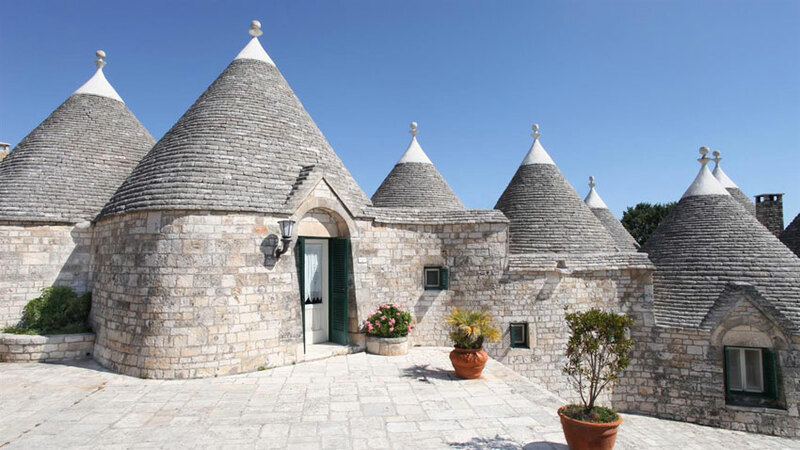 A set of cone-roofed “Trullo” houses and tufa-stone “Masseria” villas, surrounded by pines, gardens and orchards, situated on a hilly ridge 400 metres above sea level. Originally a convent dated 1790, the old burg consists of a cluster of 28 trulli, where the Benedictine nuns used to perform their daily rural routine. The old kitchen of the monastery and the stable have been converted in one of the most characteristic restaurants in the area. Not far from the trulli village, six white buildings called Masseria (Italian for “country house”) were built on the ruins of old houses. Each masseria has a number of modern bedrooms equipped with air conditioning and central heating, mini-bar, LCD TV set, direct telephone, hair – drier, safe and satellite channels. In this fairy-tale location, Tenuta Monacelle holds “Il Ciliegeto”, the restaurant where refined and typical Apulian dishes are prepared by a professional and friendly staff. In the summertime, our guests can have dinner on the breath-taking terrace overlooking the cherry garden or lunch by the swimming pool. Tenuta Monacelle could be the ideal place for a rural retreat, surrounded by some of the most interesting places in central Apulia, such as the world’s trulli capital of Alberobello, the “wine” area of Locorotondo, Monopoli with its wonderful baroque architecture, Ostuni, also called “the white city”, the coastal strip by the Adriatic Sea and the caves of Castellana Grotte. The oldest area of Tenuta Monacelle consists of 28 “Trullo” buildings built in 1790 as a monastery for the Benedictine nuns coming from the Convent of Saint Joseph, sited in Monopoli. While the word “Tenuta” simply means “Mansion”, the term “Monacelle” is more difficult to define as there are two different interpretations. The trulli village is situated on a hilltop, over 400 metres above sea level, a land inhabited by snails, which in local dialect are called “Monacelle”. However, there is another more significant explanation: “Monache” is the Italian for “Nuns” and “Monacelle” was the way the residing nuns where called by local people to diminish them. Everything in the old burg reminds us of its long past. We can still see the places where the nuns used to carry out their daily rural activities, including the fireplace where bread and other local products were made to cater local farmers. We can also recognise the building that used to be a church; it is a “Cummersa”, a building with a sloping roof instead of the cone-shaped roof typical of a trullo. While we visit the restaurant, Il Ciliegeto, we can admire the real kitchen of the old monastery, with a chimney, located next to the cow and sheep stable where the manger is still kept. The chicken coop was located on the top floor, safe from predators; the staircase that linked the chicken coop to the ground floor is still here today. Time has passed and a number of changes have been made in the old burg. Nevertheless, we can still feel the charm of that remote 1790. The Masseria San Nicola was originally built by the Prince of Carbonelli in the 17th century. 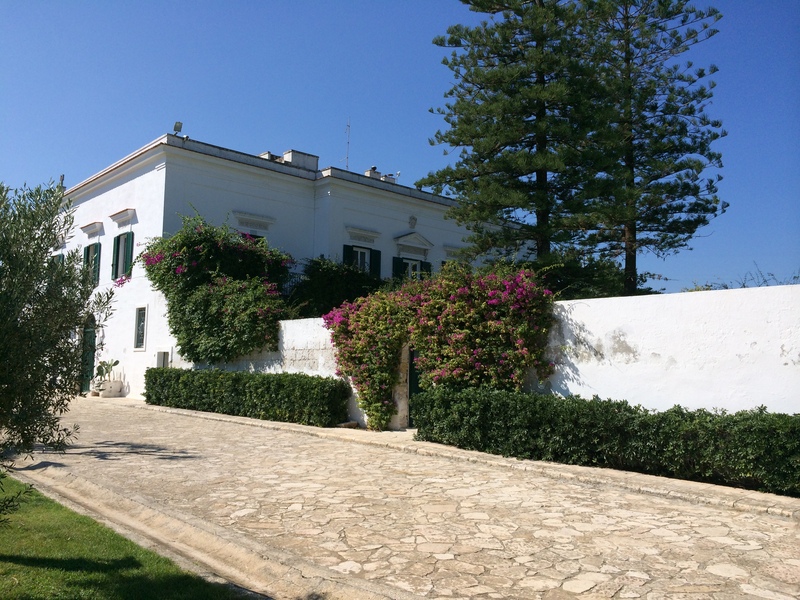 In the 19th century the Masseria was bought by Camicia family as a summer retreat. The Masseria was originally known as Masseria delle Seti, and was named Masseria San Nicola at a later stage, in honor of the patron saint of Bari. The Masseria San Nicola boasts a wonderful garden, in line with the style of the typical 19th century gardens of Puglia villas and palaces. The garden is enclosed by walls and has several walking paths, which wind between bougainvillea plants, orange and lemon trees, roses and aromatic plants, surrounded by Mediterranean scents and colors. Masseria San Nicola is located in Savelletri, a small seaside town located between Bari and Brindisi. Surrounded by centuries-old olive trees and crystalline sea, the Masseria is formed by an ancient main building with its own wonderful garden and luxurious private pool, and by four small Masseria, all overlooking a second swimming pool. All photos courtesy of Tenuta Monacelle and Masseria San Nicola. Being a small charming village of its own, the Masseria offers you a peaceful and intimate atmosphere. The union of those buildings, gardens and swimming pools gives the guest the sensation of being in a charming small village The main banquet hall is located in a cave which was originally used as a shelter for dairy cows. Masseria San Nicola is the perfect location for events and ceremonies, which will be unique thanks to the stunning beauty of this magical place. We are sure you will love this venue just as much as we do! We are looking forward to meeting you at The Italian Destination Wedding Show this Sunday, 26th October, to help you plan the most amazing wedding you have always dreamt of. To register and book your ticker, please click here. The Stylish events and Will Be Wedding and Event team.